For many Americans the attack on the Lusitania in May 1915 and death of an estimated 1,198 innocent lives including 128 Americans, solidified the belief that Germany was a brutal, degenerate monarchy. The sinking of that British ocean liner by a German torpedo began the push for American Protectionism and the United States of America for entering World War I On April 2, 1917, President Woodrow Wilson addressed Congress, asking for a declaration of war against Germany. Just over two months earlier, on January 31, the German government had announced its resumption of “unrestricted submarine warfare.” With the announcement, German U-boats would without warning attempt to sink all ships traveling to or from British or French ports. This war has been dominated by mass industrially made lethal technology, like no war had witnessed before. That meant the death of millions on European battlefields, making U.S. soldiers badly needed to fill in the depleted trenches of France. The fight on Western Front had settled into a battle of attrition, marked by a long series of trench lines that changed little over the course of four years of fighting. Wallace Patrick Campbell, enlisted Sept. 18th 1917 at Fairfield, Ca. He served as a Private, Company J, Battalion, 182nd Brigade, 363rd Regiment, 91st Infantry Division, V Corps, American First Army. The 91st Infantry Division was a National Army Division. Based at Camp Lewis, Washington, it was composed of men from the western United States. The 91st Infantry Division was famously nicknamed as the "Wild West Division” with a "Fir Tree" as its Division insignia to symbolize its traditional home of the Far West. This nickname referred to the many cowboys, ranch hands and the overall western attitude within the division. We arrived in Tacoma in September, with conscripts and enlisted men from the nine Western states and Alaska territory. The boys from Wild West Division excelled at everything, the mock trench battles, open warfare training, rifle fixed bayonets and hand to hand combat, and of course many were expert marksmen and experienced shooters. It is here in Tacoma, that Wallace Patrick Campbell meets Mabelle W, Watson, resident of Tacoma, Pierce County, Washington. ​Training at Camp Lewis was arduous, monotonous, and discouraging. Time and again, when the ranks of the company would be filled and the men proficient in elementary drill, detachments would be taken away and sent to other units. New and raw recruits would fill the vacated ranks, and it would be necessary to go back to rudimentary drill again. Since each unit was responsible to train individual personnel in initial drills, the collective regiment training program was in a state of disarray. As a result, the requirement to be competent in individual drill superseded collective training opportunities and this had a negative impact on the “Wild West” division. Their collective training was limited to mass formation marches around the training areas at Camp Lewis. Leaders in the division were taught how to march troops, but there was little focus on developing skills such as assaulting machine gun nests or coordinating fire missions with the artillery–tactics that were needed to be successful on the battlefields in Europe. One of the most important individual skills was marksmanship, and the men of the 91st focused much of their training time on weapons proficiency. By December 1917, most of the weapons for the division arrived and the live training at the Camp Lewis ranges began in earnest. Incentives to perform well at the ranges included a badge, extra pay, and bragging rights. Soldiers began on short ranges up to 300 yards, with and without bayonet. Those who did well advanced to the 500 and 1000 yard course. The 91st also focused heavily on marksmanship at night. The training environment in western Washington State provided Private First Class Walter P Campbell with some unique challenges. Through November and December, it was raining nearly the entire time for 5 weeks. He didn’t have to be out in it all the time but all the same it made it miserable. In March 1918, it was snowing and raining. It would snow an inch or two then rain for an hour or so and melt it all, then repeat the performance. The weather at Camp Lewis may not have been popular with the recruits, but there could not have been a more realistic training environment to prepare them for what they would soon face in France. Despite the unpredictable weather, while on leave Walter (Wally) not only got to see the lush beautiful country and mountains (which was a far cry from the mining towns of Jerome, AZ and Goldfield, Nevada where his father worked as Miner. Wally meets and courts Mabelle Watson. Sixteen weeks of drill and training concentrated at the individual, squad, and company levels. Upon successful completion of the first sixteen weeks, units were supposed to progress to battalion and higher level exercises. Although the manual did briefly mentioned open warfare, it stressed that “training for trench warfare is of paramount importance,” and required each cantonment area to construct a system of trenches to use for training. Different companies were assigned sectors of the range, marched stealthily into the trenches, and as a huge searchlight in imitation of the star shells on the battlefield was flashed for a moment along the targets, a heavy burst of fire came from the alert men in those sectors.”36 Another range allowed for a small size live fire range where a squad moved through unknown terrain and engaged pop-up targets at various ranges. The leaders of the 91st clearly maximized training opportunities on individual weapons and the proficiency gained through this training at Camp Lewis would benefit them greatly in the trenches of France. It was under these circumstances that the 91st Infantry Division departed for war in Europe. Although many Soldiers arrived nearly ten months prior to departure, there was excessive turnover throughout the training period. 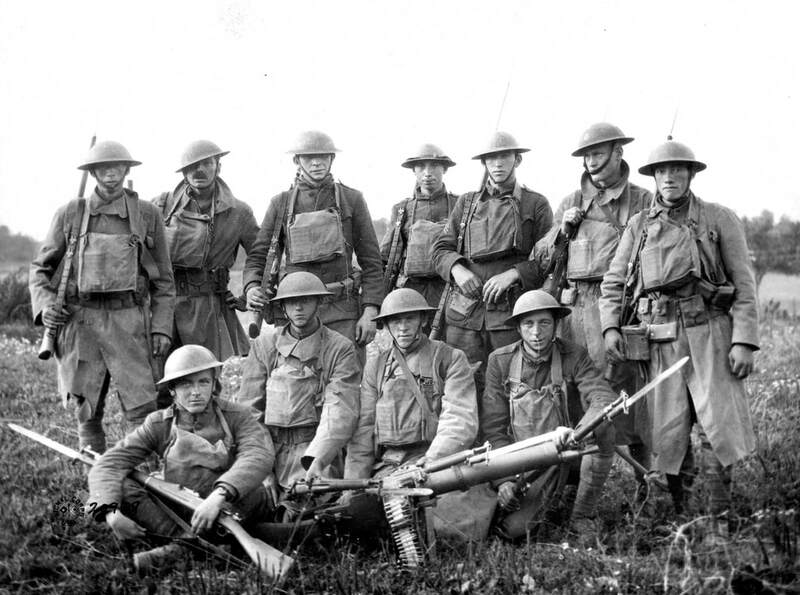 The men of the 91st division trained individual skills such as marksmanship relatively well, but the ability to execute more advanced combined arms tactics was severely limited. There was some debate within the War Department about how the Army should focus its training in the United States. Major General John J. Pershing was in command of the AEF for the entire war. Pershing insisted that American soldiers be well-trained before going to Europe. As a result, few troops arrived before January 1918. In addition, Pershing insisted that the American force would not be used merely to fill gaps in the French and British armies, and he resisted European efforts to have U.S. troops deployed as individual replacements in decimated Allied units. His approach was not well received by the western Allied leaders who distrusted the potential of an army lacking experience in large-scale warfare. In July of 1918, elements of the 91st began arriving at their assigned training areas in France, there were already approximately 17 AEF divisions ahead of them in the training process. While in France, the 91st Division had conducted additional training, but the AEF pushed it to the front lines before it was completed. These men were young and inexperienced, but they were eager to get into the fight. The decision involved the future operations of more than a million Americans. To the question General Pershing replied without hesitation: "Most assuredly: but as an American army and in no other way." ​By June 1917, there were only 14,000 American soldiers in France, and the AEF had only a minor participation at the front through late October 1917. But by May 1918 over one million American troops were now stationed in France, though only half of them actually made it to the front lines. The Allied Army had gain overwhelming superiority in front-line rifle strength as American soldiers arrive by that summer. Within certain levels of military technology, the United States was well-prepared. The basic infantrymen of the U.S. Army and Marine Corps were equipped with the Model 1903 Springfield rifle. Developed after the Americans experience against the German-made Mausers in the Spanish American War, it was an excellent firearm, equal or superior to any rifle in the world at the time. But, unfortunately, Machine guns were another matter. In 1912, American inventor Isaac Lewis had offered to give the U.S. Army his air-cooled machine gun design for free. When he was rejected, Lewis sold the design to Britain and Belgium, where it was mass-produced and used throughout the war. With the Pacifist Movement fully entrenched and a newly elected liberal President Woodrow Wilson in place, he persuaded his colleagues to boldly critique any buildup to the war, and the war itself, as a profiteering mission in which the only parties sure to benefit were industrialists. However, because of the attack on the ocean liner Lusitania along with escalating nationalism made the declaration of war all but inevitable, The high-minded rationale of Wilson, thought it best to positioned himself and the nation - as the redemptive forces that would bring about a just peace and prepare the soil in which democracy could take root across Europe. Unfortunately, with far more soldiers than supplies of modern machine guns, the U.S. Army had to adopt several systems of foreign design, including the less-than-desirable French Chauchat, which tended to jam in combat and proved difficult to maintain in the trenches. The attack on St-Mihiel, 12 September proved quite successful, The American Army quickly occupied the salient, capturing 450 guns and 16,000 prisoners at the cost of 7,000 casualties. The “next show” turned out to be the Meuse-Argonne, the battle that ultimately helped change the course of the war and contributed to the surrender of the German forces. By far, the Meuse-Argonne was the single most deadly battle for United States forces. This forty-seven day slaughter claimed the lives of 26,277 Americans and wounded an additional 95,786 out of the 1.2 million who fought. Here the 91st Division fought on the front lines of the Meuse- Argonne. In the first days of this battle, the 91st Division, although inexperienced, gained more ground than any other American division units flanks. However, it paid a heavy price in terms of American lives. Each of the German positions was skillfully organized in depth covered with elaborate belts of barbed wire and supported by concrete machine-gun and artillery emplacements which provided alternative protected positions for those weapons. All that could be done to improve observation posts. signal communications. routes, trails and light railway to assist the defense received meticulous attention by German engineer troops before and throughout the operations. In addition to the fully developed positions above mentioned were other partly organized defense lines which were intensively improved as need for their use increased. With Turkey. Bulgaria. and Austria on the verge of collapse. Germany's only remaining hope was to stave off defeat by dogged fighting on French soil until the Allies would grant favorable peace terms. Each of the German positions was skillfully organized in depth covered with elaborate belts of barbed wire and supported by concrete machine-gun and artillery emplacements which provided alternative protected positions for those weapons. It was understood that these operations promised great attrition on both sides. But it was commonly excepted that the Allies could afford substantial losses, given the continuing flow of Americans into France, whereas the Germans had largely expended their reserves during earlier operations. Note: The battle of the Meuse-Argonne Offensive (September 26 to November 11, 1918 resulted in the most U.S. military deaths in U.S. history where 26,277 soldiers were killed fighting against the German Empire. Many Historians have criticized The Corps headquarters that had issued the careless orders for the divisions to “advance at all costs”. AT ELEVEN-THIRTY that night (23/12 o'clock) the heavy long range guns of the army artillery opened fire on selected targets in the enemy country. This bombardment grew in power and in intensity throughout the night. At 2:30 o'clock, all the guns of the corps and divisional artillery, silent up to that moment, went into action together. It is useless to try to describe that bombardment; those who lay under it during the hours before the "jump-off" will never forget it. It was so vast, so stunning, and the noise was so overwhelming that no one could grasp the whole. The German trenches were marked in the darkness by a line of leaping fire, punctuated now and then by the higher bursts of some particularly heavy shell. The retaliatory fire by German batteries passed over the heads of our leading regiments. Although the 363rd Infantry found no trenches sufficient for protection, and as, the night was warm them men preferred lying on the ground on the hill, no casualty occurred during the bombardment, as projectiles from the our own artillery passed well over the heads of the men. Although the Wild West Division had shown more grit than its allied divisions on the east and west and their inability to keep pace exposed the flanks of the 91st division to enfilading enemy fire. Despite the 91st making impressive gains on the battlefield while the other divisions could not, clearly showed that the tremendous cost of their gains did not surpass the benefits. When the leading waves of the 363rd Infantry passed over La Cigalerie Butte, they entered the valley of the Buanthe into a cloud and mist which completely concealed them on Vauquois Hill less than a half-mile to the west. Similarly, the 181st Brigade, advancing with the 362nd on the right and the 361st on the left, was able to cross No-man's-land (the valley of the Buanthe) through this cloud of smoke and mist without suffering casualties. All of the 363rd waves and the liaison group between the 35th and 91st Divisions crossed No-man's-land thus concealed, the last elements leaving La Cigalerie Butte at 6 o’clock. 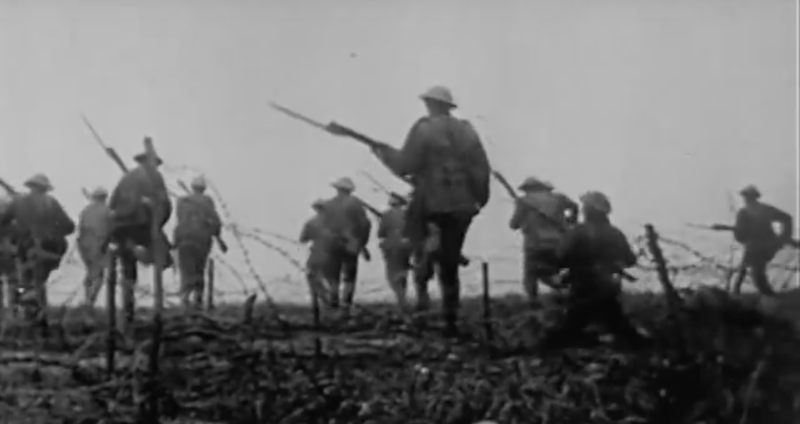 At the specified rate of 100 yards in every five minutes, the three leading regiments passed through the prepared lanes in the old French wire, deployed in No-man's-land and went forward without opposition. There was no delay in their movement. ​The two infantry battalions, with machine gun companies attached, were stationed between the two infantry brigades, ready to support either. Many prisoners and machine guns were captured by the two brigades in passing through Bois de Cheppy. German chemists had perfected a method of releasing chlorine gas from pressurized cylinders and thousands of troops were smothered in a ghostly green cloud of chlorine. The commander of British Expeditionary Force, Sir John French, called the use of gas "a cynical and barbarous disregard of the well-known usages of civilised war". The most widely used, mustard gas, could kill by blistering the lungs and throat if inhaled in large quantities. Its effect on masked soldiers, however, was to produce terrible blisters all over the body as it soaked into their woollen uniforms. Contaminated uniforms had to be stripped off as fast as possible and washed - not exactly easy for men under attack on the front line. "I fear it will produce a tremendous scandal in the world... war has nothing to do with chivalry any more. The higher civilisation rises, the viler man becomes," wrote Gen Karl von Einem, commander of the German Third Army in France. Soldiers describe a chlorine attacks, referring to the gas's characteristic green color - victims of a chlorine attack would choke. The gas reacts quickly with water in the airways to form hydrochloric acid, swelling and blocking lung tissue, and causing suffocation. The 91st Regiment suffered 3 different gas attacks during their offensive. But by this time, chlorine was no longer being used alone. Another, more dangerous "irritant", phosgene, was the main killer. But phosgene was slow to act - victims may not develop any symptoms for hours or even days - so it may not quite fit with the narrative of gas attacks at that moment in time. The officers and men after nine days of fighting were exhausted when the regiment and the Division was relieved of October 5th, 1918. 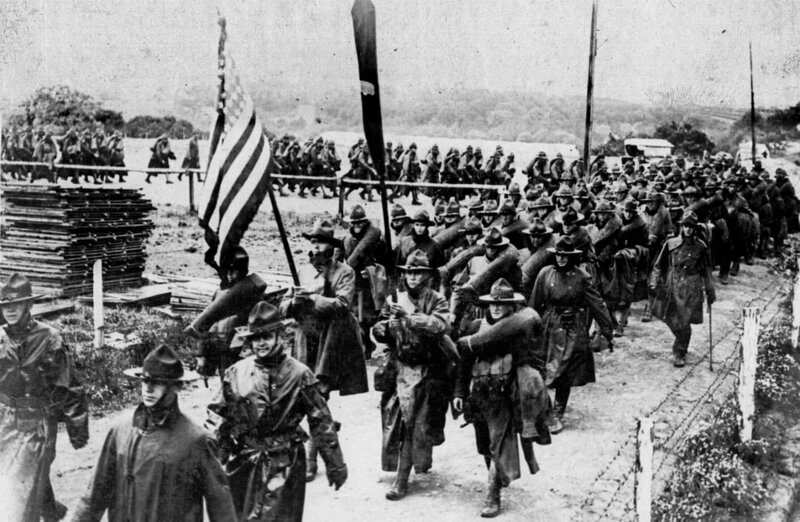 The march out of the Meuse-Argonne made with great difficulty and the men fell exhausted at every halt. The Regiment was assembled at Dombasle on Oct 7th and replacements were received to fill the ranks of officers and men for those killed and wounded. In mid-October General John Pershing ordered the 37th and 91st Divisions away from the Meuse-Argonne to be transported by rail to Belgium to assist the French in the Flanders Ypres-Lys Offensive, which had begun two months earlier on August 19, 1918. On the 19th, the 363rd arrive in the vicinity of Ypres, from there it marched toward the front, training its replacements and prepared for the Ypres-Lys Offensive. The “Boche” had been pushed back across the Lys River. The 91st was selected along with the 37th Division for operations east of the Lys River. By this time, the men of the regiment had a high reputation for its dash in offensive action. Many believed that this may be the final struggle that the enemy had forced into the open in a running fight. On October 30, the 91st was in place with the British division on their right and the French on their left and the enemy less that 50 yards away in some places. Unlike the shell torn fields of or Argonne, the Flanders battlefield of this offensive was over pastures, farms and villages occupied by Belgium civilians. The Boche had taken advantage of the field hedges, farmhouses and place machine guns in the attics of barns and snipers in windows of farmhouses. On October 31st, at 6:30 the 91st Regiment went over the top under the cover of their own artillery barrage which failed to clean out the Germans who were at close range. The assault waves were met by a storm of machine gun fire. There was canal and barbed wire to cross under this incessant fire. But he men gallantly dashed to their tasks with determination. It was only thus that the Regiment was saved from being wiped out for the loses in killed and wounded were withering in the first half hour. In one company all the officers and the First Sergeant were killed and most of the other companies had to continue the fight with only but one or two officers to lead them. Driving on in the face of enemy fire and heavy gas and high explosives shell bombardment that the Germans laid down on the advancing troop. But the resiliency of the Regiment drove the Boche form its first position and the retreat began which carried them over the Scheldt River. As the men pushed forever through the farm fields, the Belgiums, who for four years been under the helot the Boche rushed out to great the Americans with food and wine, cheering them on their way. With first their objective gained on the first day, the advance continued for a second and third day. The German retreating used their artillery was used to check their advance. On November 2, the Regiment reach the city of Audnarde, and the Germans had blown up the bridges over the river and withdrew to the heights to the east. On the night of the 2nd and 3rd of November the 91st withdrew from the line and march back to Oostrosbeke. The line was take over by the French and held until the next offensive on November 10th, when the 91st Division was again place for the attack. By this time new make shift bridges had been thrown over the River. Again the 363rd went to the front, crossing the Scheldt River in morning of the 10th. The enemy was resistance had been weaken and a few machine guns and snipers were left as the Germans were rapidly withdrawing from the heights back to Brussels. The Regiment was advancing as night fell. The next morning the battalion and company officers met for instruction to commence to next attack. They had been just dismissed back to their men when word came down that an Armistice had been signed just as the Regiment was in position ready to attack. Word that hostilities had ceased just prior before they were to go over the top on the morning Nov. 11th 1918, left some men cheering and others disappointed. Unbeknownst, Turkey had signed an armistice at the end of October and Austria-Hungary followed on November 3rd. Germany began to crumble from within. Faced with the prospect of returning to sea, the sailors of the High Seas Fleet stationed at Kiel mutinied on October 29th. Within a few days, the entire city was in their control and the revolution spread throughout the country. On November 9th, the Kaiser abdicated; slipping across the border into the Netherlands and exiled. A German Republic was declared and peace feelers extended to the Allies. At 5:00 am, on the morning of November 11th, an armistice was signed in a railroad car parked in a French forest near the front lines. The terms of the agreement called for the cessation of fighting along the entire Western Front to begin at precisely 11:00 that morning. After over four years of bloody conflict, the Great War was finally at an end. "At the front there was no celebration." Official Radio from Paris - 6:01 A.M., Nov. 11, 1918. Marshal Foch to the Commander-in-Chief. 1. Hostilities will be stopped on the entire front beginning at 11 o'clock, November 11th (French hour). 2. The Allied troops will not go beyond the line reached at that hour on that date until further orders. With only a few hours to go until 11:00, the shelling was still heavy and, it grew steadily worse. It seemed that every battery in the world was trying to burn up its guns. At last eleven o'clock came - but the firing continued. The men on both sides had decided to give each other all they had with their farewell to arms. It was a very natural impulse after all their fighting, but unfortunately many fell after eleven o'clock that day. All over the world on November 11, 1918, people were celebrating, dancing in the streets, drinking champagne, hailing the armistice that meant the end of the war. But on the front there was no celebration. Many soldiers believed the Armistice was only a temporary measure and that the war would soon go on. As night came, the quietness, unearthly in its penetration, began to feed their anxieties, eat into their souls. The men sat around log fires, the first they had ever had at the front. They were trying to reassure themselves that there were no enemy batteries spying on them from the next hill and no German bombing planes approaching to blast them out of existence. They talked in low tones. They were nervous. After the long months of intense strain, of keying themselves up to the daily mortal danger, of thinking always in terms of war and the enemy, the abrupt release from it all was physical and psychological agony. Some, of a steadier temperament, began to hope they would someday return to home and the embrace of loved ones. While other, could think only of the crude little crosses that marked the graves of their comrades, brothers from boot camp. Some fell into an exhausted sleep. All were bewildered by the sudden meaninglessness of their existence as soldiers - and through their teeming memories that paraded a swiftly moving cavalcade of St. Mihiel, the Meuse-Argonne and Sedan. What was to come next? They did not know - and hardly cared. Their minds were numbed by the shock of peace.